In 2015, Callaway Golf introduced a revolutionary ball called Chrome Soft that combined distance and control with a high level of soft feel unheard of in a tour ball. 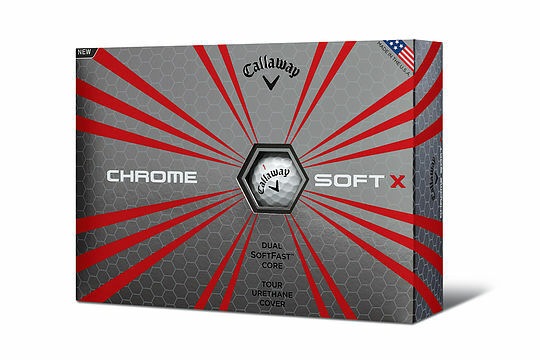 Now Callaway has introduced a new ball, Chrome Soft X, to give players another performance choice. Chrome Soft X and Chrome Soft share four-piece ball construction consisting of Callaway’s innovative two-layer Dual SoftFast Core, spin-regulating SubMantle and ultra-soft urethane cover, as well as flight-extending HEX aerodynamics. The difference lies in Chrome Soft X’s firmer core and cover combination, which promotes more ball speed off the tee, more spin through-the-bag, and a piercing and workable ball flight. Chrome Soft X and Chrome Soft are available in white and yellow color options. Chrome Soft X will be available at Australian retail starting February 3, 2017. New product introduction retail price for a dozen Chrome Soft or Chrome Soft X balls is A$59.99 (NZ$69.99). Callaway Tour Staff pros who currently play a Chrome Soft Golf Ball include Phil Mickelson, Patrick Reed, Jim Furyk, Danny Willett, 2016 PGA Tour Rookie of the Year Emiliano Grillo, 2016 Ryder Cup standout Thomas Pieters, Daniel Berger, and Wes Bryan, who won three times on the Web.com Tour last year to earn a “battlefield promotion” to the PGA Tour.